Recent research shows that children between the ages of 8 and 12 spend an average of six hours a day on social media, while teens can spend upwards of nine hours a day on Facebook, Instagram, Snapchat and other social media platforms. Social media plays an important role in the individual and social development of children and teens. It helps expose them to new ideas and information, and offers convenient ways to build communities and connect to support groups. But it can have a downside, too, explains John Piacentini, PhD, ABPP, UCLA child and adolescent psychologist and director of the UCLA Center for Child Anxiety Resilience Education and Support (CARES). 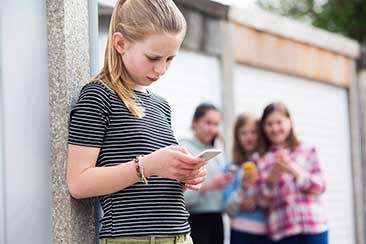 To determine if social media may be negatively affecting your child, ask yourself: • Are they using their device in secret or lying about device use? Are they isolating themselves from family, friends or activities they once enjoyed? Do they feel frustrated or upset when online? Do they compare themselves to others online and express feelings of inadequacy? If so, it may be time to implement some resilience strategies and set boundaries around social media usage. If negative behaviors persist over a period of time, or cause serious anxiety or physical or social problems, seek professional help. Set limits on screen use, especially before bedtime. Try device-free family dinners. Be a good role model. Limit your own screen time and show them appropriate ways to cope with social media disappointments. Emphasize the importance of personal interaction over social media use. Try to avoid completely banning social media, as this might isolate your child from their peers and differing viewpoints. It’s important for children and teens to learn who they are and what is important to them — outside of social media. Parents can help by encouraging their kids to think about what makes them happy and their goals and values.